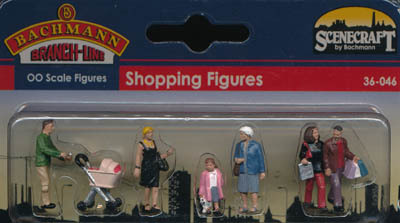 Bachmann are one of a number of major producers of model railways that include some figures in their range. These figures claim the railway scale of 'OO', which is 1/76th scale, so a bit small compared to 1/72nd scale figures, but in fact all seem about right for 1/72 scale. They come in small sets of 6 to 12 figures and are assembled and painted at the factory, presented in appealing blister packs that make it easy to see the figures before you buy. The quality of the sculpting is fairly basic, but the painting is not bad considering they are mass-produced, and of course they are not expected to be closely scrutinized anyway, but rather seen as a minor decoration on some layout where the trains are the stars. None come with bases, which is a bit annoying even if they are to be used on a layout. 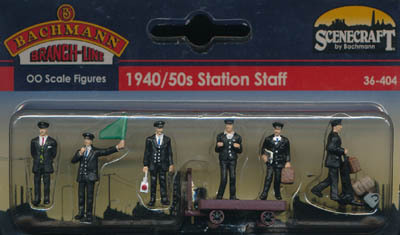 Naturally the subject matter is mostly train operators and passengers, and all are for the 20th century or later, but nevertheless they could provide possibilities for the military modeler, and doubtless many visitors will be thinking of converting and/or repainting them to their own needs. One set in particular will peak the military interest (which will be obvious when you see it), but here we have included all the figures in the range, along with very brief comments on their usefulness. Half these men wear a suit and half non-matching jacket and trousers, though the difference is only one of paint. To be honest the suit is almost universal amongst businessmen, so the others have a rather more casual look, particularly the one who has chosen his yellow jacket for today's outfit. 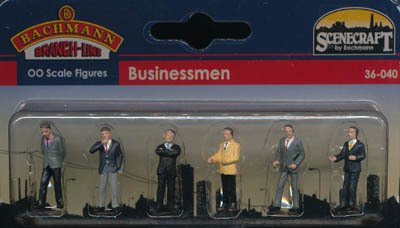 Not easy to see what else these figures could be used for apart from what they are, though even as businessmen they all lack a briefcase or similar, which seems an odd omission to us, given that they are supposed to be in the street or waiting for a train. Smart menswear covers a pretty wide time frame as changes in such fashion tend to be small, but of course all these figures are quite modern. Just the fact that none are wearing a hat makes them well after World War II! 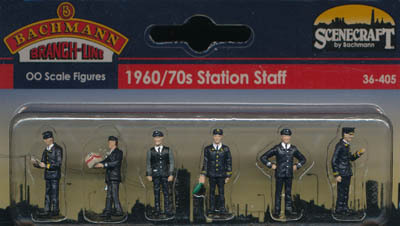 Like all the Bachmann range, this set depicts British subjects, in this case law enforcement and security personnel. Generally the sets are either described as belonging to a certain time period, or else are assumed to be suitable for today, but this set is different. The police figures have a fairly old-fashioned look to them, and that is because police uniform has changed a great deal in the past 20 years or so. The first two constables wear the No.1 dress jacket and shirt sleeves, and both have the custodial helmet so recognisable worldwide as British police uniform. In fact today police generally wear high-visibility jackets and/or stab vests, and they also have a duty belt which carries a large number of items (such as would make Batman jealous). These two figures carry nothing, and so have an appearance almost never seen these days except perhaps at certain formal occasions such as passing out parades. The custodian helmet is still worn in the majority of British forces as at the time of writing, although a peaked cap is also common, but the headgear of the two female officers, which is a peaked cap, is no longer in use. This design, similar to a version worn in the Royal Navy, has since been replaced by a bowler style headgear. In addition, most female officers wear trousers rather than a skirt, and the same sort of upper body wear as the men, i.e. jacket, stab vest, high-visibility jacket, plus of course a duty belt. So again these figures are not relevant to modern Britain but one at least 20 years ago. 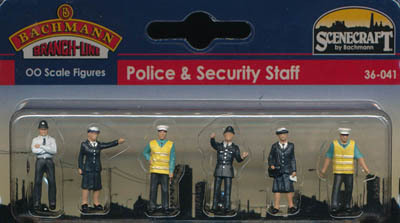 Lastly, the final two figures are simply labelled as security staff, and as such they of course do not follow any rigid uniform standards. However both wear peaked caps and high-visibility jackets over a mid-green shirt which would still be reasonable today. 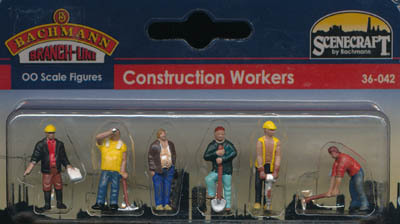 Construction workers are common enough in urban areas, but these have an old-fashioned appearance. That is because only one man is wearing any sort of high-visibility clothing, and most have no form of hard hat, so wouldn't be allowed anywhere near a construction site today. Still useful for people doing small works in private homes, for example, but we thought these were some of the weakest examples of sculpting in this range. The man with the spade is quite flat, and while we liked both the poses with a pick, overall the figures did little to peak our interest, and not easy to think of military uses either. These are modern figures, and all the men wear the same basic uniform of smart trousers and jacket over a white shirt and tie, with a peaked cap on top. The woman blowing the whistle has a similar outfit to the men but with a skirt and some sort of peak-less cap. 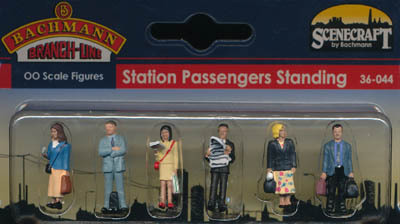 The first figure has a ticket machine, and figures three, four and five all seem to be waving off the train, while the last holds a radio and looks to be in charge. Different companies within the British transport system have different uniform regulations, but everything here looks fine, though the luggage trolley, called a sack truck, looks old-fashioned to us and to be honest we have not seen such an item at any railway station for many years, though perhaps they still exist in goods yards. Today stations tend to have the four-wheeled case trolleys also seen at airports, and those are of course self service. Anyone that has travelled on a train has seen these people on the platform. The man carrying two bags looks ready to board, but the rest are reading a newspaper, a book (more likely a kindle these days), looking at their phone or simply staring into space lost in their own thoughts. All perfectly natural, but to be honest none look like they are in a war zone, so perhaps not much utility in these figures for those of us with something more dramatic in mind. Pretty simple set this; half a dozen people sitting reading a newspaper, looking at their phone or just patiently waiting for a train that will probably pass through the station several times a minute but rarely stop and never let them on! We would have to admit that it is hard to see any of these figures in a military context. We really liked the couple holding hands (achieved using two separate pieces), but thought the choice of pure white for painting the old lady's hair was a bit extreme. We earnestly hope that the child is holding a soft toy by the ears and not a real animal, but while she could pass as a refugee for World War II, for example, the rest of the figures probably only really work in their intended role, of decorating a model railway high street. All these figures are dressed in coats and peaked caps, and the two with the coat open reveal a waistcoat underneath. This is fairly typical working man's attire for the middle of the 20th century, so suitably repainted these could be a variety of workmen. To our eye we think the poses begin with two locomotive drivers (the second is sitting, though it is hard to tell in our photo), then two firemen, then someone with an oil can and finally someone that is perhaps cleaning or polishing their engine. Some scope there for workmen on all sorts of construction sites, such as digging defences around Britain in 1940 or Moscow in 1941, Also the last figure could work well as someone surrendering. 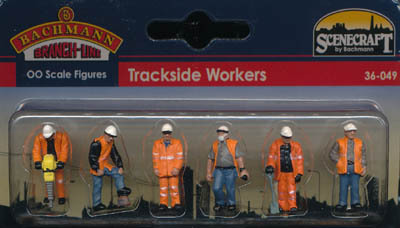 This is an obvious inclusion for a range dedicated to model railways. High-visibility clothing was first introduced on Britain's railways in the mid 1960s, so that and the hard hats help to date these figures to relatively modern times (though the style is very much of the present era). Like many in the series, one of the figures here is made up of more than one piece, so naturally is assembled and glued before being painted in the factory, but the resulting pose is more natural, even if the join, while good in this set, is not always so seamless. No particular military applications spring to mind with this set, though of course modern military engaged in engineering or construction projects will often also wear high-visibility clothing - something of a contrast to their normal camouflage clothing worn underneath! What we have here is two men using a theodolite to survey some piece of land, and four others using levers (we won't pretend to understand track-laying tools) to lay track. 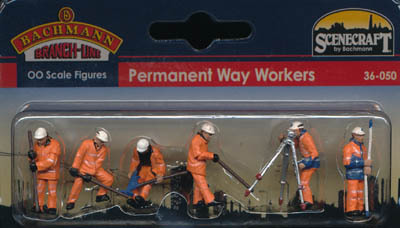 All wear jackets and trousers painted as high-visibility, and hard hats on their heads, making them fairly typical of many kinds of construction workers. The survey team might be hard to find an obvious use for outside the civilian arena, but the rest could be adapted to various pioneer or artillery roles potentially.Most of these poses benefit from multiple parts which make them very realistic and anything but flat, with quite nice detail on the equipment. Never having seen inside a 'Traction Maintenance Depot', we can offer no meaningful observations on the quality of these figures. Most of them look like they are operating heavy machinery, but the man on the far right seems to be linked with the red thing, which may perhaps be some form of storage. Doubtless some train enthusiasts will know what they are doing, but for our purposes we saw overalls and caps and thought of tank crew or men maintaining any sort of vehicle or modern weapons system. Simple overalls like these perhaps date back to the early days of motor vehicles, the last years of the 19th century, so there is a fair amount of scope for use in any conflict of the last century and more. Civil engineers, construction workers, builders or just plain workmen, call them what you will, these guys are a common sight in all our towns and cities. All wear hard hats, which are in the British style except for the man using the drill, who seems to have one in the American style. Like the rest of this range, these unbased figures mostly fail to stand on their own, though the fourth man along in the red shirt, who is leaning on his pick, has the head of this below the level of his feet, so will be a challenge to have a base added. This must be one of the most surprising choices for a set of figures. Many a railway layout will have goods trains with coal trucks, and during the 1960s and 70s the railways were a major transporter of coal in the UK, but unless you are going to put a coal mine on your layout it is hard to see why you would need some miners. 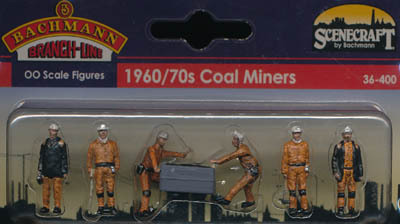 In fact four of the poses are very sedentary and frankly quite dull, merely standing there, but the two men moving the mine cart are quite realistic and work well. However again it is hard to imagine how you would incorporate this in a layout. The painting is actually quite good on these figures, and in particular the grime is nicely done. Very much a special interest set however. These are all adolescents, almost certainly boys, and they have a very old-fashioned look to them. The first four all wear what used to pass for school uniform back in the 1950s and 1960s, for example, including short trousers and school caps. The first holds a camera which clearly pre-dates the invention of the smart phone, and the others have notebooks (the paper kind undoubtedly), while the fourth also has a satchel on his shoulder. Figures five and six are more casually dressed, but still have the feel of at least a generation ago, which is quite understandable. These last two are half sitting - presumably perched on a fence or railing somewhere, and again one has a large (by modern standards) camera. 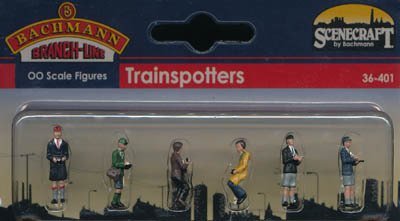 We do not know if many children still indulge in trainspotting, but they certainly do not look like this any more. Another fascination small boys often have is with military hardware, so perhaps these youngsters could be watching some tank, but essentially there is little obvious military use for these pacific figures. 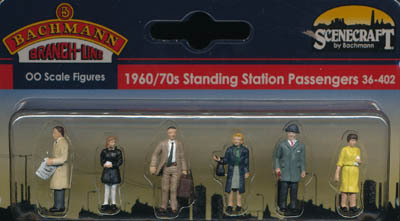 More railway passengers, this time from the 1960s and 1970s. The man in the suit and carrying a case is pretty timeless, but the rest do have a feel of those decades. 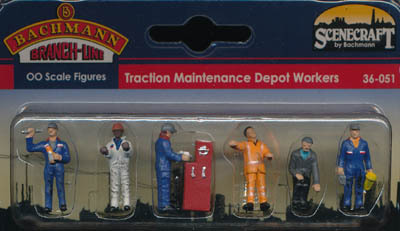 This collection of men in overalls has obvious uses for the military modeller in tank parks and motor pools all over the world, not to mention other areas such as naval and aviation scenes. 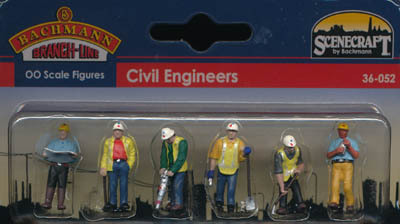 The short man at the end with thinning, grey hair is clearly meant to be the foreman, so is not quite so useful, but most of these figures could be very useful indeed. Britain’s railways suffered during the War due to an understandable lack of investment, followed by nationalisation in the late 1940s and modernisation (including replacement of steam) in the 1950s. 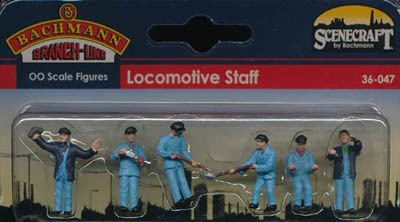 Such a major period of change is also a popular one for model railways, particularly as it is the last hurrah for steam, so such a set of railway staff to match makes good sense. 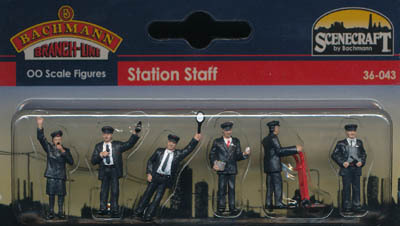 Our top row show various platform staff, starting with what might be a station master with his pocket watch chain visible. Like the rest he wears a smart jacket and trousers with a waistcoat and a peaked cap, and is typical of the period. The guard with the flag and whistle is similar, as are the other two. We particularly liked the man carrying the lamp, but all are quite nice. The bottom row contains the two porters, one with a sack truck, plus a trolley (held by the second man) and several pieces of luggage - small but nicely done. 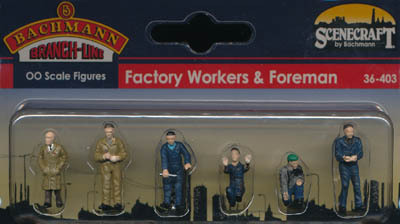 The sculpting is reasonable but the factory painting quite basic, and apart from the obvious use in some World War II railway diorama there is little else that can be done with these figures. Still worth knowing about if some domestic scene is contemplated from the War or soon thereafter. 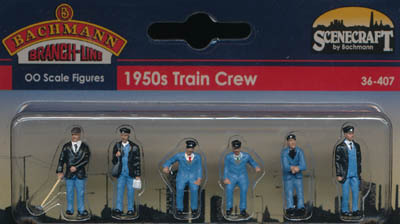 Labelled as for the 1960/70s, these figures wear the jacket and peaked cap that was introduced by British Rail during the mid 1960s, though it must be said the sculpting is not very sharp, and the cap in particular is rather a mess here. We wonder if the man with the grey sleeves is a porter, but the rest are in a smarter uniform. The first man carries a parcel and the second holds a flag for waving away the train (though again poorly sculpted), while the third holds some long narrow item we could not recognise. Given the particular cut of these uniforms, there is little scope for using these figures anywhere else, unfortunately. This product as not yet been released. During the 1950s Britain's railways used steam, diesel and electric locomotives, so these figures could be driving some very diverse engines. The third man is a wheel-tapper, using his hammer to tap wheels to detect faults in them, though this job was phased out at this time due to better maintenance and better quality wheels. He seems rather smartly dressed for such a job. The last three figures are all for the cab itself. 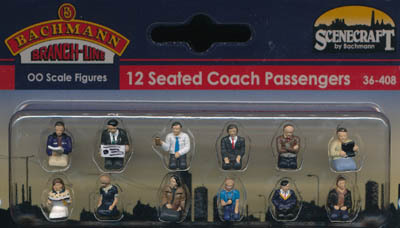 These figures, all seated and chopped off at the knees, are obviously meant to be positioned inside railway carriages. 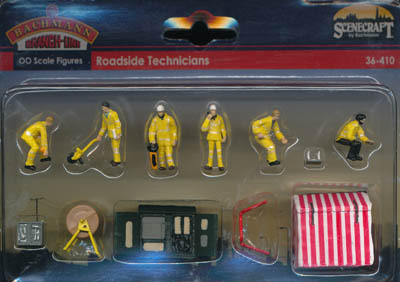 They could equally well be placed inside a multitude of vehicles of any sort, so perhaps they can be repainted and used to decorate some of the many kits of vehicle kits that are sold without any occupants. This is more like it. 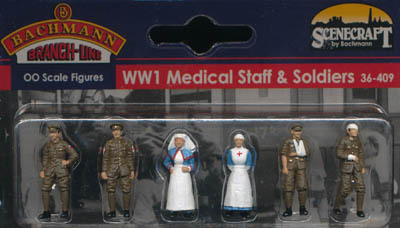 In fact this is a very surprising set for a railway company, and was made to complement their WWI ambulance train set, but for us it provides some really useful British Great War medical figures and some casualties. The first two are part of the RAMC, and at the front they would be bearers or orderlies, responsible for tending and evacuating the more seriously wounded, though they would normally have worn a red cross armband on the left arm, which neither here do. Since these men are beside an ambulance train they are well back from the front, and so are presumably orderlies. Both have the correct red cross badge on each upper arm, though here they are grossly larger than the very small actual insignia. Like the rest of the Army they wear standard service dress and peaked caps. The second man has what appears to be a stiffened cap, looking like the first type issued, while the other may have removed this stiffening. For some the highlight is the pair of nurses, as very few such women have yet been modelled in this scale. Both are perfectly accurate in costume, though like the men their lack of action makes them fairly dull poses. Finally we have a pair of casualties. As usual their apparent injuries are very neat and acceptable to a modern audience - one man as an arm in a sling and the other a bandage round the head and another round a wrist. Both wear the normal service dress and have no belts or webbing. The cap is again unstiffened, and like the orderlies the uniform is reasonably well done. The basic factory paint job does not flatter these figures, but their sculpting is pretty reasonable. The inactive poses do not help matters, and the lack of any bases is not helpful either, but these are still useful figures for an important but inevitably neglected aspect of the Great War. Only the Airfix WWI British Infantry set offers matching medics and casualties, though other sets could provide suitable stretcher cases. We can do better than 'Roadside Technicians' - these are telecoms engineers, and anyone in the UK will be familiar with the sight of them on our streets. An interesting choice by Bachmann, but we like the scattergun approach that throws up sets like this, and this one is really rather good. With more content than most of the rest of the range, you get six figures plus some fairly meaty accessories. The figures are, from left to right, spray-painting in order to mark out some new digging, using a surveyor’s wheel to measure distance, carrying something (perhaps a multimeter), using a radio/mobile phone/test handset, (perhaps) feeding out cable and finally sitting on a small stool working on the first item in the second row with toolbox close at hand. That item is a large green cabinet much seen in British streets, and is a 'primary connection point', or wiring cab for short. Next to that is a safety barrier, followed by a maintenance engineering tent and lastly a cable reel. All these items are really nice, and perfectly correct for the modern day. Military or historic uses are very hard to imagine - all the men wear modern hi-vis clothing and are perfect as what they are, but probably for little else. The accessories are great, so a lovely product, but mainly for the intended market, which is model railways. 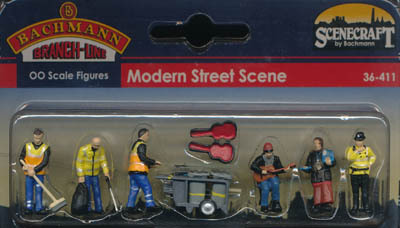 This is another eclectic collection of modern figures, and all are often to be seen on the streets of the UK. Our top row is devoted to the street cleaners, all wearing the usual high-visibility jackets that we are all so used to seeing these days. All are nicely done and in very typical poses, and the cleaning cart is a really nice touch. A nicely complex little model, it is supplied already assembled and glued, so the bins cannot be removed. The third figure is presumably supposed to be pushing this cart, although his hands only meet the cart's handles if it is tilted forward on its rest, so he is not actually moving it at the moment, which is a pity. The second row begins with a street entertainer (you might prefer the term 'busker'), sitting on a little stool and playing his guitar. Another nice figure, and clearly made up of multiple parts, but all glued and assembled at the factory, which includes the non-separate stool. The open case for collecting contributions is another nice feature. Next we have what looks to be a street seller, which in the UK means the Big Issue magazine, but doubtless there are equivalents in other parts of the World. This is a shortish lady in a hooded jacket, and she has her vendor licence around her neck as she should. Finally we have a police officer, appropriately dressed in high visibility jacket and bowler-type hat, which means she is far more typical of the appearance of police today than the previous very old-fashioned Bachmann set. She seems to carry an array of kit on her duty belt, as she should, though this is poorly detailed. In fact all the figures are fairly basic in detail, though this is only really noticeable on the police officer. The standard of painting is also fairly basic, though the figures are appealing at a distance, which on a railway layout is how they would normally be seen. Not much scope for use in more historic contexts, but these are nice figures and well thought out.